New allegations have been made that deported Iraqi asylum seekers were beaten by UK Border Agency staff to get them off a plane in Baghdad. The International Federation of Iraqi Refugees claims one man was handcuffed, beaten and dragged off the plane and another was left with an injured arm. The UK Borders Agency (UKBA) rejects the allegations, saying only "minimum force" was used by trained personnel. 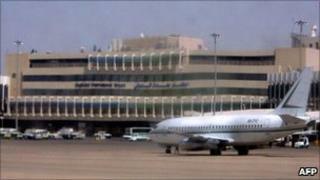 It said 35 Iraqis had assaulted its staff and tried to damage the plane. The International Federation of Iraqi Refugees says it will complain to the UN refugee agency, which is investigating similar claims made in June. The chartered flight flew out of Luton airport on Monday. The UKBA says it was carrying 49 Iraqi failed asylum seekers. However the International Federation says there were more than 60 aboard the deportation flight. On arrival in Baghdad, a number refused to get off saying they were being forcibly deported, according to Sabar Saleh Saeed, who was on the plane. "We stayed where we were but the G4S security guards forced handcuffs on us and started to beat us when they were dragging us off the plane," he said. "They were swearing at us, beating us. Four of them grabbed me to force me off the plane. "They grabbed my neck and punched me. My eyes went dark. I could not see any light. I saw many other refugees with blood running down their faces." "When I was on the steps on the plane they were still boxing me. There were a lot of Iraqi police there. "They took over from the G4S guards when I had got off. Then the Iraqi police beat us with their sticks." Another claimed he was unable to move his arm after security guards beat him. Lokman Hama Amin said: "I was shouting, asking them to let me go because they were breaking my hand but they carried on beating my shoulder. Now I cannot move my arm - I have put it in a sling." Matthew Coats, head of the UK Border Agency's Immigration Group, said: "We reject all allegations that Iraqis returnees removed from the UK were mistreated by our staff. "On arrival in Baghdad, approximately 35 returnees refused to disembark the aircraft, assaulted escorting staff and attempted to damage the aircraft. "Minimum force - which means control and restraint techniques by trained personnel - was used to effect disembarkation for this group." The UKBA went on to say that minimum force was used during boarding, on the flight and during disembarkation to prevent returnees from escaping and causing harm to themselves, others or the aircraft. In line with normal practice for charter flights, senior UKBA staff were on board and present at the disembarkation and did not witness mistreatment by either escorting staff or Iraqi officials, the UKBA added. On arrival, all returnees were processed by the Iraqi authorities in line with their immigration and security procedures, according to the UKBA. Dashty Jamal, secretary of the International Federation of Iraqi Refugees, said: "Those security guards responsible for physically assaulting the deportees must be brought to justice. "We are asking for all the human rights and progressive people in the UK to stop this barbarism and demand an end to this inhuman forcible deportation policy." The UN refugee agency, the UNHCR, is currently investigating other allegations that deported Iraqi asylum seekers were beaten by UK Border Agency staff on a flight in June. It said all 14 of the deportees whom its lawyers in Baghdad spoke to alleged that they had been beaten and forced to get on the plane in London. The UKBA has also rejected allegations of mistreatment in this case and said the detainees had no right to remain in the UK, and had had their appeals dimissed by the courts.